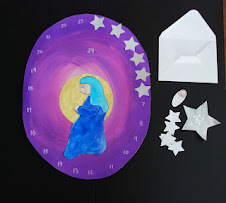 Here is a great project to do with your little ones. There are no shortage of hand and foot projects out there but this is my favorite. I have done this with a gazillion kids and they always turn out wonderful. This year I did them with Kindergarten and Grade 1. That's 80 kids in all. (can't believe that we washed that many feet!). I have seen this done with 3 handprints but I think the foot makes a better angel body. You can also do these on fabric if you want, just use acrylic paint instead of tempera. If you are doing a classful of kids it helps to have a system. I had a helper, so one would do the foot and the other the hand. Set up your workspace. We worked on the ground, I set up my dropcloths which are just vinyl tablecloths (they work like a charm). Place out a chair for the child to sit on. Remove one shoe and sock. Pour some blue tempera into a foam plate, double it for extra strength. Press foot into paint. Press foot onto paper to make a print. You want it centered but have the toes towards the bottom to give you some extra space to put on your head. Lift off and place immediately into wash up bin. This is where those Kindergartner's get the spa treatment! Towel off and put sock and shoe back on. Now on to the handprint. We selected only one hand for ease in cleanup but you can certainly do both if you wish. Place yellow tempera into double foam plate. Press hand into paint with fingers slightly spread apart. Press into place. Repeat on other side of the footprint for two wings. I found you could easily get two good prints without having to put the hand back into the paint. Place hand immediately into wash up bin and dry. 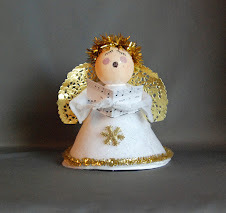 Your angel should look like this now. Let dry for a bit. With a paintbrush and some blue paint paint in the arms. Some kids have a tendency to make really long arms so ask them to keep it within the yellow of the wings. For the hands I cut up a sponge into a small circle. Mix up some skin tone paint with white, red and brown to whatever shade you desire. Using the sponge make 2 hands at the end of your arms. I took part of that same sponge and cut a larger circle for the head. Using our skin tone paint stamp on the head at the heel of the footprint. You could use a paintbrush and paint a circle but this worked great for the 5 - 6 yr olds. With leftovers from that sponge I cut some square shapes and we used some brown paint for hair. The idea was to have the kids stamp on some shapes around the head but the kids had their own ideas. They did swoops, some did curls, and some had the Rapunzel thing going. We then took glitter glue in gold and silver and made our halos. Let dry. If you want you can get your kids to paint on the eyes and the mouth. I find with really young kids that this leads to angels who look like they have been in a fight. We hole punched some black paper and glued it on for eyes. We then took a fine red marker and made the mouth. 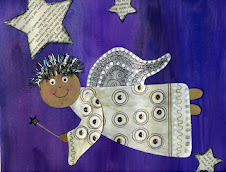 Finally we glued on some sequin stars around the angel before mounting the completed angel on blue paper. Give it a try. 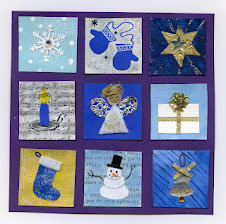 For a more permanent keepsake you could use acrylic paint and make a banner or table runner. You will have to paint on the eyes and mouth in this case. see you soon and I can't help it......Way To Go STAMPS!!!!! For those of you not in Canada the Calgary Stampeders won the Grey Cup yesterday which is the Canadian equivalent to the Superbowl. We are so proud. Virtual Sketch Date for November was completed yesterday for those of you interested. I haven't been able to find time to do my own painting with things at school so I didn't get a chance to participate. If you get a chance check it out. We made ours into a wall hanging for a Christmas gift from the kids to their parents.